Homestyle comfort food is as easy as a Ficelle Picarde! Now you can make it from scratch or improvise with this quick and easy version. In a frying pan or large saucepan, add the olive oil and a tablespoon of butter. 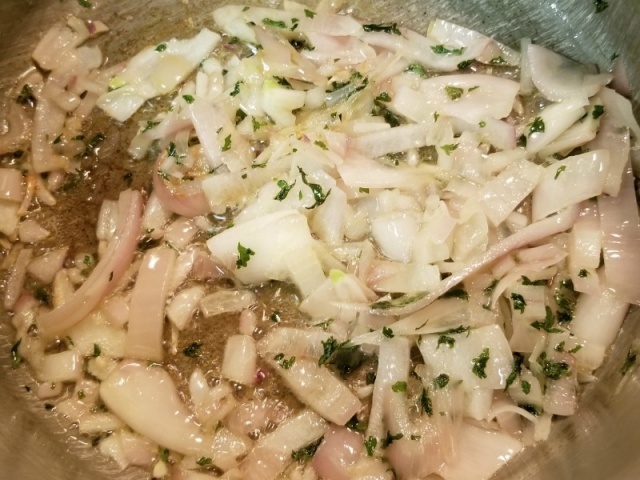 When sizzling, add the chopped shallots and sauté until they take on a light color. Add the sliced mushrooms and sauté along with the shallots until they have rendered their liquid and take on a nice color. 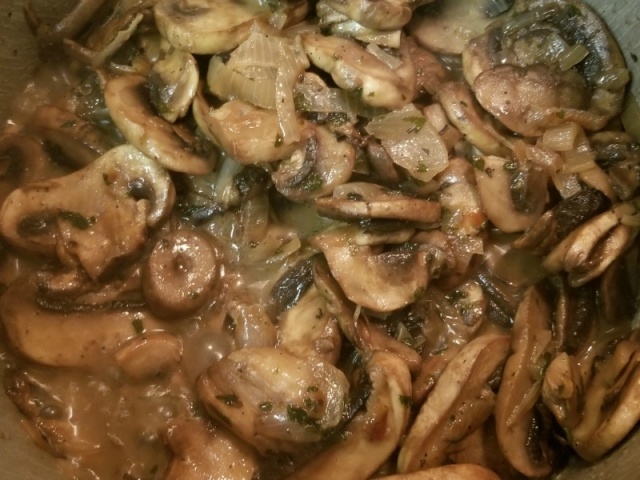 To the pan, add a little white wine to finish cooking the mushrooms. Set aside to cool. Duxelles is more akin to a “paste” – See notes about how I prepare the ficelle with a variation of the authentic duxelles recipe. Prepare a simple Béchamel sauce. Butter a 13 by 9 inch casserole dish. Set out the crêpes/tortillas along with the ham, cheese and mushroom mixture. On a large plate, place a crêpe/tortilla and top with 2 slices of ham. Spoon mushrooms down the middle of the tortilla. 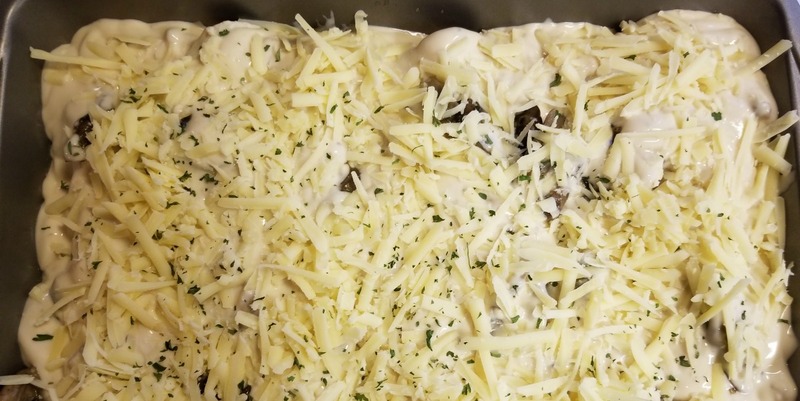 Sprinkle a little bit of shredded Emmentaler on the mushroom mixture – just enough cheese to bind the mushroom bits when it melts. Roll the crêpe/tortilla making sure the ham, mushroom and cheese are securely rolled into the center then place in the butter dish, seam side down. When serving in individual dishes, tuck the ends under to fit. When using a large casserole, only make as many as fit in the pan. You don’t want them to be squished together because it allows you to add some béchamel sauce between each ficelle. 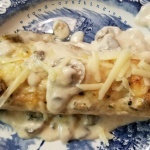 Pour the sauce evenly over all the rolled crêpes then top with shredded Emmentaler. Bake at 350* for about 20 minutes or until bubbly and golden. Sprinkle with any leftover cheese just before serving. 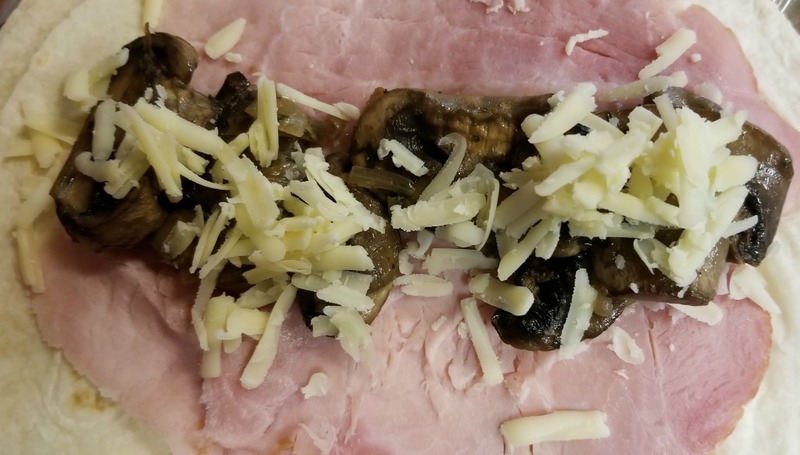 We prefer mushrooms to be a little coarser than “finely chopped” and reduced to a paste. Once cooked, I find that the resulting mixture is more mush than an ingredient with some texture. I slice the onions, then rough chop them. Short on time, I often (as is the case in this particular recipe) don’t even bother to chop the cooked mushrooms into smaller pieces. Just my take.